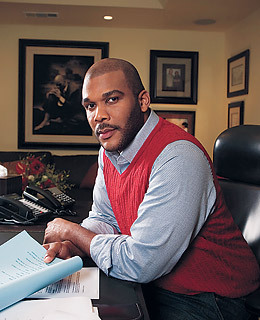 So, I realize Tyler Perry is an entertainment mega-mogul who owns his own friggin’ film studio, but it is still pretty difficult to think of him and not get a visual of the makeover he undergoes to portray grandma Madea–an extreme makeover that led to him becoming the extremely rich man he now is. Two days before Christmas Mr. Perry used a bit of that money he’s earned to help a real-life grandmother rebuild the home she’s lived in for forty years after it burned to the ground. 88-year-old Rosa Lee Ransby and the seven great-grandchildren she is raising by herself escaped injury but were left homeless by the tragedy. The local fire chief asked the Coweta, GA community for donations to assist the family, and within hours Tyler, who lives in nearby Atlanta, came to the rescue in a major way. Not only is Mr. Perry paying for Ms. Ransby’s home to be reconstructed, he has rented a home nearby for her and her family to live in until their new home is finished, which will be sometime next year. Tyler will fill the home with new furniture as well. It is a time like this that must make being a several hundred millionaire feel pretty amazing.